I preluded to the 10 days of treats happening at work in my last blog post and today was my day! 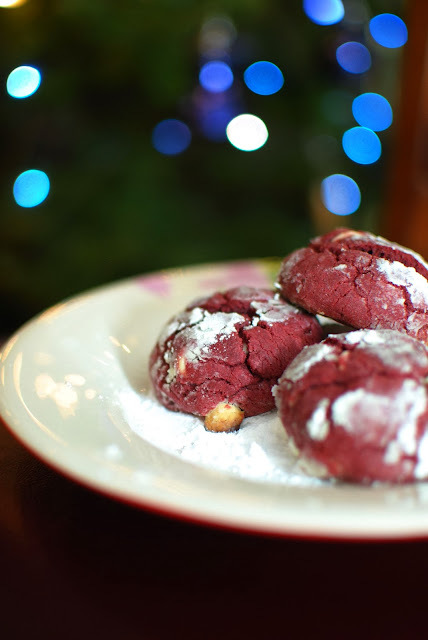 I couldn't think of a better reason to make these red velvet cookies! I put them together in about 15 minutes, they chilled for two hours then they baked and ta-da! Perfect crinkly cookies to share with your new co-workers! I heard compliments during the day and I brought home a completely empty cookie tin...so I'll say they were a success. They're not as red as I had envisioned but I used liquid food colouring. I prefer gel food colouring because it's more pigmented but I don't have my usual baking supply here with me yet so the liquid was all I could get at the grocery store on my lunch yesterday! Lately the time I've had to bake has been at night and truthfully, I'm not very good at taking photos without natural light. I do have a very nice roommate who has an external flash that I've been playing around with, but it's just not the same. So I apologize in advance for the lack of eye-pleasing photos. These will have to do until I figure it all out. These photos are kind of embarrassing compared to the beautiful things you see on Pinterest...but this recipe is too great to not post about despite the weird pictures. But back to the cookies! 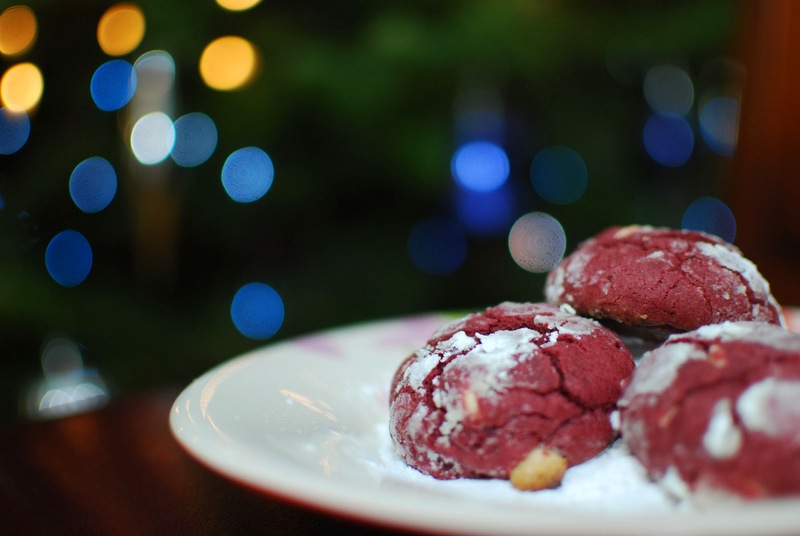 They have an incredibly soft texture, rolling them in the icing sugar is the perfect kick of sweetness and their red colour is quite appropriate for the holiday season! Two weeks from today will be Christmas Day! What!? How! Already?! I'm counting down the days until I get to go home for the holidays and spend some much needed time with family and my cat. 1. In a bowl, mix together flour, cocoa powder, baking powder, baking soda and salt - set aside. In a stand mixer, whip butter and sugar until light and fluffy. Add in eggs one at a time and mix until combined. Mix in milk, vanilla, lemon juice and food colouring. With the mixer on a low speed (or else you'll see a cocoa-flour dust storm in your kitchen), mix in the dry ingredients until all is incorporated. Stir in the white chocolate chips, cover the bowl and let chill for 2 hours or until firm enough to roll into balls. 2. Preheat the oven to 350*F. Pour the icing sugar into a bowl, form medium size balls with the dough and roll in the icing sugar, fully coating the entire cookie. Place on a cookie sheet and bake for 13 minutes until tops have crackled and the cookie is firm. But until next time, happy making!